Support for Israel is the No. 1 focus for this year´s Rosh Hashanah and Yom Kippur sermons among American rabbis, according to a new survey. Seventy-two percent of rabbis surveyed said they are talking about the Jewish state, followed by 42 percent who are discussing “creating a better future,” 37 percent who are focusing on forgiveness and 34 percent who are urging greater participation in synagogue life. Almost 140 rabbis responded to the first Rabbinic Leadership Survey conducted in early September by the Synagogue Transformation and Renewal Foundation, or STAR, a nonprofit dedicated to synagogue transformation and leadership development. Most of the respondents were Reform and Conservative rabbis, and are taking part in one of STAR’s synagogue revitalization programs. One-quarter of them were women, and 49 percent were age 40 or younger. Prior to 9/11, all the experts and all their paradigms had assured us that the enemy had been defeated. All the bad ideologies of the twentieth century had been discredited; therefore, it was impossible for people to commit themselves to any more such nonsense. Capitalism or liberal democracy or both would make sure that the world would never need to resort to life-and-death struggles over anything of importance, since everything of importance would be forthcoming from the automatic expansion of Western values through the process of globalization. . . . The enemy was not supposed to exist according to any of the major geopolitical paradigms that were current prior to 9/11. The one point which all of these paradigms agreed was this: there was no longer any underlying necessity for two different groups of humanity to be enemies to each other, since it was now possible, at least in principle, for men to work out their differences. . . .
No one, of course, had meant the Great War to be the Great War. As is well known, almost all the belligerents in World War I expected the time frame of this war to be similar to that of the Franco-Prussian War -- measurable in weeks and months, not years. Indeed, this schedule had been built into the German war plan. No one, in his worst nightmares, expected World War I to develop into the ghastly system of trench warfare, in which battles, like Verdun and the Somme, could last months and consume casualties reckoned in the millions. The horror of the war had been, prior to the event, simply unthinkable. . . . Similarly today, in the post-9/11 world, we know now that catastrophic terror is a possibility, and this knowledge can never be eluded. It changes the way in which we imagine our future, just as it changed the way those who had lived through the Great War were condemned to imagine theirs. In a world where everyone else is accustomed to making rational economic choices, the man who is prepared to fight to the death will normally be appeased. The same logic applies to whole societies. The result is an unsettling paradox: the more the spirit of commerce triumphs, the closer mankind comes to dispensing with war, the nearer we approach the end of history, the greater are the rewards to those who decide to return to the path of war, and the easier it will be for them to conquer. . . .
Forgetfulness overcomes every successful civilization. Its transformation of men into peaceful, commercially minded, liberal cosmopolitans is a large-scare version of the trustful community that leaves its doors unlocked. . . . The ideologies that came to dominate Europe after the Great War were precisely the ones that preached the doctrine of ruthlessness most effectively, in each case justifying the doctrine by an appeal to a different myth. Each myth justified the use of ruthlessness by a certain select group of human beings. In Italian fascism, it was those who were naturally heroic and daring. In Nazism, it was the master race. In Communism, it was the Vanguard of the Proletariat. Each of these groups was entitled to behave ruthlessly and to scoff and make fun of the hypocrisy and cant of middle-class values, of the corruption and lack of direction of parliamentary democracy, of the selfishness and money grubbing of the self-satisfied bourgeoisie. And who could blame them. . . .
Before the break point, the civil party thinks that the ruthless party can be accommodated to civilized standards by means of patience and forbearance, much in the same way that we might try to domesticate a feral animal. We are convinced that we will bring him around. We attribute his ruthlessness to some defect in his psychology. Perhaps he has an inferiority complex and is acting out with us. Perhaps we are an authority figure, and he is rebelling against us. . . . We may blame ruthlessness on someone’s religion or culture or economic status. We never dream of identifying it for what it is -- a strategy that works. The civilization that the United States is now called upon to defend is not America’s or even the West’s; it is the civilization created by all men and women, everywhere on the planet, who have worked to make the actual community around them less addicted to violence, more open, more tolerant, more trusting. Civilization, in this sense is Chinese, American, African, European, and Muslim. Those who are working for this purpose are all on the same side, and we all have a common enemy. It is an enemy whose origin goes back to the dawn of history, and indeed, the enemy that began the whole bloody and relentless cycle of violence and war: the eternal gang of ruthless men. . . . The article is dedicated to the memory of Oriana Fallaci. It is far and away the best essay written to date about the Pope’s speech -- which Harris terms “moving and heroic” -- putting it in the context of broader historical, religious and philosophical themes that have not generally been understood. It would be a disservice to attempt to summarize or excerpt it. 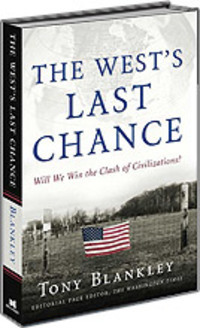 Tony Blankley’s book “The West’s Last Chance: Will We Win the Clash of Civilizations?” is out in paperback this week. The question mark in Blankley’s subtitle reflects his belief that the issue still lies in the balance. His theme is that the jihadist threat (“far closer than most people realize to taking over Europe”) is as great as was that of the Nazis taking over Europe in the 1940s. One Jerusalem organized a bloggers’ conference call with Blankley yesterday to discuss the book and other issues. The recording of the call is posted here. The blogs on the call were American Thinker, Boker tov, Boulder!, Gateway Pundit, Grandaddy Long Legs, In Context, Israpundit, Jewish Current Issues and Mere Rhetoric. 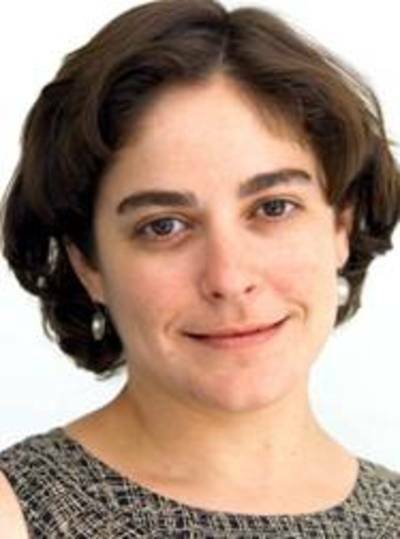 Click on the blog names to read the posts, particularly Omri Ceren’s stellar analysis and Anne Lieberman's autobiographical reflection. There is a particularly good colloquy on the recording between Blankley and Lieberman about the division between those who see a threat and those who deny it, and whether bloggers are simply preaching to their own choirs. Blankley’s theory is that people tend to see things through the prism of other issues (including an obsessive Bush hatred) that can cloud their judgment and perception, but that the cumulative effect of many individual blogs -- like that of many individual votes -- is significant, and impacts both opinion leaders (his weekly column this morning cites three different blogs) and politicians. And one never knows, he said, the ultimate impact of a single article or a single post once it enters the Ethernet. And vice versa I think: As a result of the bloggers call, and the collective impact of the above posts, more people will now know of an important book the MSM has largely downplayed or ignored, and it will have an effect. Kudos to One Jerusalem for the medium, and to Tony Blankley for the message. I think for those of us who want a more aggressive stance towards Iran, it was a very successful week. Ahmadinejad had this famous appearance before the Council of Foreign Relations this past week -- you know, the seat of the foreign policy establishment in the United States. And he goes in there and denies the Holocaust at some length in front of these people, most of whom walked out saying this is very unsettling to see who we're dealing with. Differing views were apparent from the first question of the evening, when Peter G. Peterson, CFR's chairman . . . noted that he and David Rockefeller, who was also a participant in the meeting, had visited Auschwitz . . . [and] that the majority of American Jews and non-Jews alike were “horrified” by Ahmadinejad's assertion that the Holocaust was a “myth.” The Iranian said he doubted Americans all held such a view. . .
Martin S. Indyk, who has served twice as the U.S. Ambassador to Israel, and a tour as assistant secretary of state for Near Eastern affairs, noted he had endeavored during the Clinton administration to work out a lasting peace between Israel and the Palestinians, but that Iranian-supported terrorists “did everything possible” to prevent it. The Iranian president again repeated what he has said before, namely that all Palestinians should “decide” their future. On the question of Iran’s nuclear program, the Iranian president broke no new ground. He was questioned by Brent Scowcroft, a former national security adviser, as to why Iran insisted on going ahead with its uranium enrichment program. Others asked why Iran did not accept the offer made by President Bush for Iran to have peaceful uses of nuclear energy so long as it stopped the enrichment program. Ahmadinejad repeated that Iran had the right to develop a peaceful nuclear program, and that it had no intention of building nuclear weapons. . . .
Kenneth Roth, executive director of Human Rights Watch, said "Iranian journalists are imprisoned and newspapers are closed” and that "elections are not free." . . . . This led Ahmadinejad to claim that his country was freer than the United States. . . . When asked by Fareed Zakaria, a columnist and editor for Newsweek, whether there was a way to restoring the good relations that once existed between the two countries, the Iranian president blamed the United States for the break in relations following the Iranian revolution in 1979. He did not mention the seizure of American embassy hostages for 444 days. . . .
They’re “open!” They’re de-stabilizing Iraq right now, but they’re “open” to not. And they’d be glad to have relations with the Great Satan -- just ask! So: the American foreign policy establishment meets with a Hitler wannabe, gets rolled -- in a "dialogue" with a ludicrously non-responsive Ahmadinejad -- and the president of the CFR then assures the world they heard things of "considerable interest" and recommends "negotiations." How dumb can the American "foreign policy establishment" be? The 2006 Miss World Contest will be held on September 30. Although the other competitors are not chopped liver, Israel has a pretty formidable contestant, with a beautiful name: Yael Nezri, an 18 year old student, already rated “hot” by the leading beauty pageant blog. Yael was born and grew up in a small town, Kiryat-Shmona, situated in the north of Israel. Her family is from the combination of two cultures: Holland from her mother’s side and Morocco from her father’s side; she has two older sisters. Yael has just graduated from high-school and is looking forward to having an academic education in one of Israel’s universities; her dream is to be a successful model. She enjoys: working out, reading, watching TV, and listening to music. Her favorite food is spaghetti. Personal motto is: "To benefit from each moment in life and always see the bright side of everything". She is a very optimistic person. Kiryat Shmona. At the northernmost tip of Israel, a mile from Lebanon. The area subjected to endless terrorist attacks over the years, the target this year of ceaseless rocket fire, at times over 80 a day, in the Hezbollah war, 20,000 of the 25,000 residents evacuated from their homes, the remaining 5,000 (without the financial means or assistance to flee) living in underground shelters for a month. But Yael Nezri is a very optimistic person, and this week she is competing for Miss World. Beauty, youth and optimism, from Kiryat Shmona, after a barbaric war. She may not win the 2006 Miss World Contest. Israel may not have lost, but certainly did not win, its 2006 war with Hezbollah. But in the war of ideas and accomplishments, in the battle between the forces of life and those of death, between the armies of decency and those of barbaric cruelty, between the 21st century and the 7th century, Israel has already won. And Yael is a small but significant symbol. It is part of what gives one hope that the Prayer for 5767, by another beautiful daughter of Israel, can come true. Rosh Hashanah for 5767 begins at sundown, and continues until Sunday evening. L’shana Tova Tikatevu -- A Good & Sweet New Year! Between 35,000 (according to police estimates) and 40,000 (according to bloggers who were there) were at the solidarity rally for Israel outside the U.N. on Wednesday. The event was covered admirably by the blogosphere: LGF and Atlas and Elder of Zion have great pictures, and One Jerusalem has remarkable videos of the speakers. The posts by Anne Lieberman, California Yankee, Jerry Gordon, Peg Kaplan, Ed Morrisey, Scott Johnson and Meryl Yourish were particularly impressive, and the New York Sun again demonstrated it is the most essential newspaper in New York. 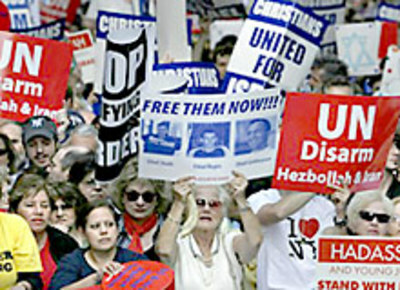 When there is a demonstration involving tens of thousands of people, on the steps of the United Nations, when the attendees include the Governor of New York, a Foreign Minister from a nation in the Middle East, three Ambassadors, prominent individuals such as Elie Wiesel and Alan Dershowitz, and when -- in addition -- one of the speakers is . . . the U.S. Ambassador to the United Nations, you might (if you’re the MSM) check in and see if he says anything significant, since he is appearing at an important moment in a highly visible public forum. It’s really heartening to see this crowd here today -- very heartening for me to have a chance to leave the United Nations building, walk across the street and come out here in the sunshine. I want to say that the President yesterday gave I think the clearest statement of American views of liberty and democracy in the Middle East that any president has ever given. He spoke directly to the peoples of Middle Eastern countries who suffer under tyrannies and authoritarian rule. He spoke of the hopes of people in countries like Iraq and Afghanistan that seek democracy. He talked about of the importance of spreading democracy in countries like Lebanon and Syria. This is critical to the long-term resolution of the conflict in the Middle East. But we have a long way to go, sadly, until we get to that point. The first thing we can do is what Security Council Resolution 1701 calls for. 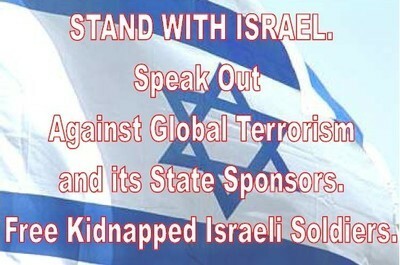 We want the unconditional release of the captured Israeli soldiers. [Crowd calls “Free Them Now! Free Them Now!”] That’s exactly right. That’s exactly right. But we want a lot more too. We want a lot more too. We want Iran and Syria to give up their sponsorship of international terrorism. Iran alone contributes over a hundred million dollars a year in support to Hezbollah. It supplies Hamas, as does the government of Syria. These practices have to end if they want to be accepted into the community of civilized nations. So we want that too. But we want more than that too. We want Iran to give up its pursuit of nuclear weapons. And I can tell you that the proliferation of weapons of mass destruction -- nuclear, biological or chemical -- in the Middle East is a profound threat, not only to Israel, to the United States, to our friends in the region, but to the world as a whole. And let me just say this is not simply a problem of Iran’s pursuit of nuclear weapons. It’s a worldwide problem. We speak of the “axis of evil.” We mean, for example, North Korea’s proliferation of ballistic missile technology into the Middle East. North Korea is the world’s largest proliferator of that technology, selling and dealing to regimes like Iran. So it’s not just Iran pursuing nuclear weapons. It’s Iran pursuing longer range and more accurate ballistic missiles as well. We have laid down a foundation. We have said to the Iranians “we the United States are prepared to talk to you, even though you continue to support terrorism, because of our concern about nuclear weapons.” This is an extraordinarily generous offer by the United States. We ask only one thing of Iran: that they stop their pursuit of uranium enrichment activities. And to date the Iranian government has refused to do that. We have made it clear until they do that, unequivocally and verifiably, we will move for sanctions -- not just in the UN Security Council, but against financial institutions. We will pursue the President’s Proliferation Security Initiative to stop the flow of weapons and materials and technology of mass destruction. President Bush has been very clear on this point to Iran. He has been very clear. He has said over and over again it is “unacceptable” for Iran to have nuclear weapons. And what he means when he says “unacceptable” is, that it is unacceptable. [Emphasis on last word by Bolton]. So there is a lot we want out of the region because we want peace, we want stability, we want freedom. I thank you all for coming here today. I appreciate the honor of being here. And good luck to all of you. When the Head of State (directly or through his authorized representatives) says to another nation that its possession of nuclear weapons is “unacceptable,” the use of that word is (as I’ve noted here and here) significant in itself. But more than that: you don’t say that word repeatedly; you don’t explain that its meaning is self-explanatory; you don’t present it without qualifiers or adjectives or modifiers; you don’t have it said officially (on the same day) by your Secretary of State, UN Ambassador and White House spokesperson; you don’t have it repeated later by your Vice President; and finally, you don’t re-emphasize it on the steps of the United Nations, to a crowd of tens of thousands, with the head of state of Iran in the building behind you -- you don’t do all that and then accept an Iranian nuclear weapon. There may be various tactics in pursuit of your strategy, pursued in successive stages. But having said that word repeatedly, one thing you cannot possibly do -- not simply because of your regard for your reputation, or your place in history, or even simply because of your concern for the credibility of American diplomacy in the future, but rather because you know that, in fact, the problem is a threat to the whole world -- is leave office with it unhandled. If it is unacceptable, you don’t go home and accept it. And one thing we have learned in the last six years is that George W. Bush means what he says. The message Wednesday was undoubtedly meant not only for the crowd, but -- since it was delivered in a highly visible public forum by an important official of the United States -- for Iran. By choosing not to cover it, the MSM not only violated basic principles of journalism (and the NYT its own credo), but missed the most important story of the day. As the [Democratic] party skews to the left, it has increasingly adopted the anti-Israel philosophy and attitudes that animate so many on the left. Conversely, the Republican Party has never been more welcoming to Jews nor as supportive of Israel. . . . While Democrats demagogue the rise of evangelicals in America (and in the Republican Party) and demonize them as a threat to the Jews, such mythmaking does not reflect the fact that evangelicals cherish the Jewish people, for reasons having absolutely nothing to do with end-of-days scenarios. . . . 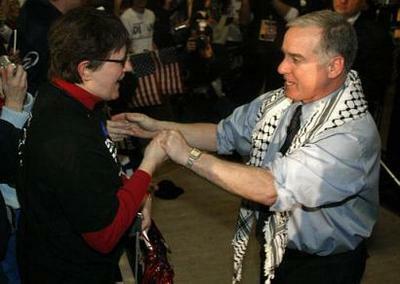 While Democratic National Committee head Howard Dean joyously dances with a keffiyah draped over his shoulders, Republican National Chairman Ken Mehlman waxes nostalgically and publicly about his Bar Mitzvah. It has been apparent for some time that the Democratic Party of John F. Kennedy no longer exists. The old joke has it that Jews live like Episcopalians but vote like Puerto Ricans. At some point, to the detriment of the Democratic Party, they will vote like Jews. Ed's list of Democrats who will take over important congressional committees if the Democrats take the House in November should serve as an incentive. Following the Macaca episode, the Jewish press published stories that appeared on the Internet that explored your possible Jewish ancestry on your mother’s side. You’ve been quoted as saying your mother is not Jewish. But it has been reported that her father, your grandfather Felix, whom you were given your middle name for, was Jewish. Could you please tell us whether your forbears include Jews, and if so at which point Jewish identity might have ended? Fox said her motive was curiosity. "I thought it was important to find out is this part of his heritage, because if it is nobody knows it. Do you deny part of your heritage for political reasons?" Allen, surrounded by cameras and microphones after the event, hadn't cooled down. "What do you mean, 'make me so angry'?" he demanded angrily when asked why Fox's query had made him so angry. "To make whatever sort of comment that was, you just don't judge people by their ethnicity or their religion," Allen said, fuming that Fox would "drag my mother into this." The senator said his mother was the one who taught him about tolerance. "Because," he repeated, "my mother's father was incarcerated by the Nazis in World War II." Peggy Fox isn't running for U.S. Senate. George Allen is. So, whether you liked that question or not (personally, I didn't see it anything to get angry about; it's like asking Jim Webb about his Scots-Irish ancestry or any of us about our ancestors), this is all about George Allen -- why he gets so angry so often, why he is so prone to attacking those he sees as weak and/or threatening, etc. As another famous Jew, Sigmund Freud, might have said in this situation, George Allen appears to have some deep-seated "issues" regarding his Jewish heritage -- and regarding many other things as well. [Emphasis added by JCI]. Another famous Jew. George Allen is one, Sigmund Freud is another. Just like asking Jim Webb about his Scots-Irish ancestry. Nice, Lowell. So long, Jim. As for George Allen’s "anger," and his "issue," you can listen to Fox’s question, and see Allen’s response, by clicking here, and judging for yourself. Allen's statement yesterday afternoon on the subject is here. The LGF thread is here. NYC Noon Tomorrow -- 2nd Ave & 47th St. Participants are urged to bring a shofar. Thousands of Shofarot will sound in a call for unity with Israel. 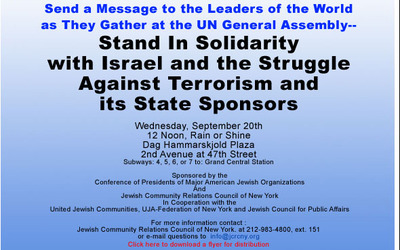 Sponsored by the Conference of Presidents of Major American Jewish Organizations and the Jewish Community Relations Council of New York.